Architect Russell Buchanan's magnificent restoration of Edward Durrell Stone's most famous house has just won the prestigious National Preservation Honor Award from the National Trust for Historic Preservation. The announcement was made today. Co-recipients of the award are homeowners John and Jennifer Eagle, designer David Cadwallader, Mesa Design Group and Sebastian and Associates. Oak Court represents one of modernist architect Edward Durrell Stone’s most significant residential projects. 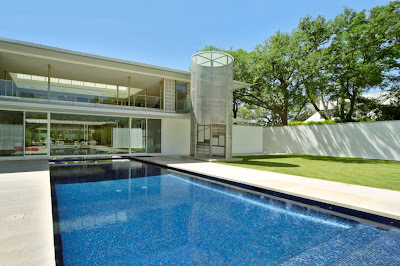 Designed in the mid-1950s, the house incorporated the interior courtyards, sunscreens and lavish materials that were hallmarks of its architect. Over the years, a number of alterations destroyed many of the most fundamental design characteristics of Stone’s plan. Thanks to new owners, a meticulous restoration has returned this modernist masterpiece to its original grandeur. 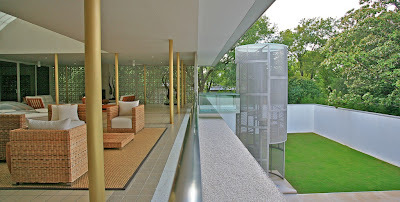 Modeled after the architect’s design for the U.S. Embassy in New Dehli, the house featured white brick grillework, an iconic dining room that floated on a body of water and the finest of materials including floors of polished white marble, wood accents in Italian walnut and columns wrapped in gold anodized aluminum.